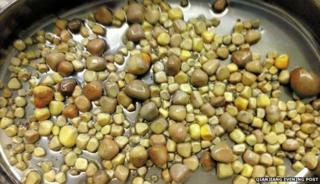 Doctors in China have removed 420 kidney stones from a single patient, it's reported. The man, named Mr He, underwent a two-hour operation to remove the stones at a hospital in Dongyang, eastern Zhejiang Province, the Qianjiang Evening Post reports. Doctors at the hospital say it's likely that his tofu-heavy diet, and a lack of water, are to blame. "Soy products, especially gypsum tofu, are very high in calcium, the excess of which cannot be excreted from the body without a sufficient intake of water," says Dr Wei Yubin. Mr He visited the doctor in May complaining of abdominal pain, and a subsequent CT scan revealed his left kidney was packed full of stones. The doctor says if Mr He had waited any longer then his kidney would have had to be removed. While having 420 kidney stones sounds uncomfortable, it's a long way off the world record. In 2009, a doctor in India removed 172,155 stones from a patient's left kidney during a three-hour surgery, according to Guiness World Records.